The origins of these fish come from Nigerian rivers, Africa. Kribensis are considered to be dwarf Cichlids. The size of an adult Krib can reach up to 10 cm. Male Kribensis Cichlids tend to be a few centimeters longer than females. The lifespan of these fish can reach up to 5 years or even more, if kept properly. The famous aspect of these fish is their coloring, which is why they are very famous among tank keepers. Usually they have a red or a purple coloring on their stomachs. Another important factor that makes these fish very famous among hobbyist is that they are very effortless to keep. 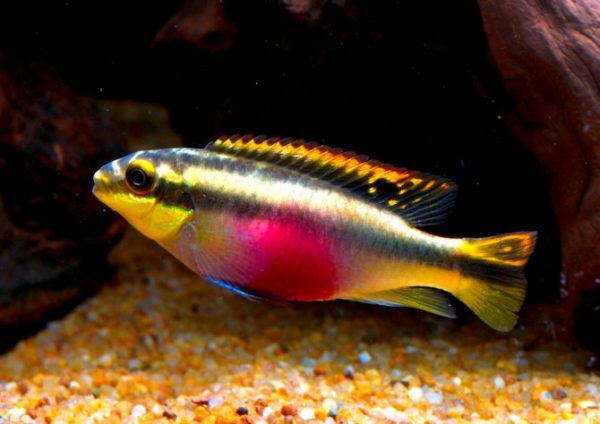 It is not very much recommended to keep Kribensis Cichlids with any tank mates, as they can get very aggressive sometimes especially during the breeding period. But if you are going to keep them with other fish it is recommended to get depth or upper water swimmer. And also you need to keep them in a large tank, so the size of the aquarium should be at least 30 gallons. For these fish you should get tank decoration for them to make houses in such as caves, flower pots, tubes and so on. Overtime you will notice how each couple of these fish marks their territory in the tank so they will not bother each other anymore. The required tank substrate for these fish is a sandy substrate which they can dig into. Also, it is highly advised to cover the top of the tank as these are very active fish and can even jump out of the tank. The temperature of the water in the tanks should be 24°C – 26°C and the hardness of the water should be 5° to 20° dH. As for the pH level of the water, it should be about 6-8. Kribensis Cichlids are omnivore types of fish. They eat all types of foods frozen, live or flakes. You can feed them with worms and insects. These fish feed from the bottom of the tank so you need to make sure the food gets there otherwise other fish will eat the food and they will be left hungry. It is recommended to feed Kribensis Cichlids 2-5 times a day with small amounts of food. This will keep the water quality better for a longer period of time rather than feeding them ones with a large amount of food. Mating Kribensis Cichlids is considered to be pretty easy. When the water quality is good and the tank setup is good they can be breeded. If you are going to breed these fish you need to add some caves or pipes in the tank. Females are usually the first ones to initiate the breeding. They hint the males about it with their pink bellies and by moving their fins and bodies. Then the female will lay about 40-100 eggs in a cave and will start to protect the eggs. While the male will be protecting the female and the eggs. The eggs will start to hatch after 5-7 days. It will take the fry about 5 days to start swimming. Usually Kribensis Cichlids are very good and protective parents. You can feed the fry with baby brine shrimp and powdered flakes. Sometimes one of the parents might get aggressive and only one parent will care for the juveniles. In this case the aggressive parent should be taken out of the tank. These fish species can be kept alone as well as in community tanks. But if you have decided to keep them in a community tank you should be careful while choosing tankmates. They can get pretty aggressive with some fish types. They can bite the fins of slower fish. They like to have their territory that is why it is recommended to keep them in bigger tanks if you are going to keep them with other fish. You should not keep fish that are smaller than Kribensis with them as they will most likely eat them. So for tankmates you can choose fish on any species that are larger from them or are at least of their size. So, you are now fully aware of all the specifications of Kribensis Cichlids. These fish seem to be perfect for keeping in tanks, even though they can be a little aggressive sometimes. 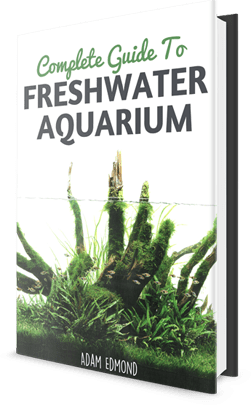 Their bright coloring will add a beautiful look to you aquarium. You just need to follow some requirements and everything will be as easy as ABC. Feeding these fish is pretty easy as you can feed them with almost anything. Breeding can also be easy as you do not have to do too much. They will take care of the process themselves. As for the tankmaes be careful, as they can be very aggressive sometimes especially with smaller species of fish and shrimp. Hopefully this article will help you with your decision of getting a Kribensis Cichlid fish.